The Indian Navy has released a new maritime security strategy document. Last week, the Indian Navy held a landmark combined commanders’ conference on its premier naval platform, the INS Vikramaditya. The senior officers’ conclave – the first of its kind to be organized aboard an aircraft carrier – was made memorable by a rousing address delivered by Prime Minister Narendra Modi, in which he outlined New Delhi’s many challenges in Asia, paying particular attention to India’s strategic stakes in the Indian Ocean Region (IOR). The discourse may have pleased naval commanders in attendance – not least because the prime minister had a word of praise for the Indian Navy’s strategy for the IOR, a presumed reference to the recently released Indian maritime security strategy document. The new publication has been the subject of much discussion in maritime circles recently. In the absence of an online version for public viewing, however, speculation abounds about its many assertions and pronouncements. This review is an attempt at capturing the publication’s salient highlights – its guiding principles, the assessment of threats and challenges, recommended operational methodologies, and proposals for strategic outreach and force-projection. Titled “Ensuring Secure Seas,” the Indian Maritime Security Strategy (IMSS-2015) is an updated version of a previous publication, “Freedom to Use the Seas” – the Indian Navy’s playbook for security operations during the past decade. Released just weeks before the commencement of an international fleet review at Visakhapatnam, the new document is an enunciation of contemporary nautical precepts, and a reflection of the Indian Navy’s current maritime operations philosophy. This is the third maritime guidance document since 1998 and the most comprehensive account of India’s nautical imperatives, challenges, strengths and opportunities. As in the case of its predecessor documents, the new volume attempts to outline India’s naval operational determinants, which it describes as a combination of imperatives and drivers – the former concerning national economic needs; the latter, a combination of traditional and irregular threats at sea. The IMSS impresses right-away with its immaculate presentation, logical structure, and the rigor with which its framers outline the Indian navy’s operational maritime posture in the Indian Ocean. The document systematically tackles myriad themes and contingencies connected with maritime operations. Even though it deals with roughly the same issues as its predecessor publication, the effort put into revising and updating operational concepts and threat-scenarios is apparent, providing an accurate picture of India’s maritime environment. The document highlights some key facets of the nautical dynamic in India’s maritime neighborhood. One, it acknowledges the hybrid nature of maritime challenges – the blurring of lines between traditional and non-traditional threats. In this, it emphasizes the need for a “seamless and holistic approach,” even as it makes a case for greater coordination between different maritime agencies. Two, it validates the use of the Indian Navy as the primary instrument to secure the seas for economic purposes. Highlighting India’s unique maritime geography with a central location in the IOR, the authors deem it obligatory for New Delhi to play a strong security role in the region. In this, they underscore the need to protect Indian and regional interests, particularly the security of the vital sea lanes. Equally the document recognizes India’s bilateral relationships in its maritime neighborhood – a space where the Navy must operate in the spirit of mutual respect, and with due regard for international law and established nautical norms. In assessing India’s maritime compulsions, the IMSS focuses attention on the security of the Indian Ocean sea lines of communication (SLOCs), the preservation of national influence in the maritime neighborhood, and the protection of overseas investment and Indians residing abroad. Consequently, it seems to prioritize security against irregular challenges in the Indian Ocean over other traditional threats. The authors avoid mentioning potential aggressors, instead choosing to evaluate unconventional threats in pointed detail. An interesting chapter on “maritime security operations,” charts the conceptual shifts in the Indian Navy’s approach to constabulary and benign operations, bringing out contemporary assessments of maritime terrorism, piracy, armed robbery, humanitarian crises, peace support operations and non-combatant evacuation missions. The document’s most compelling account is its exposition of India’s principle maritime enterprise – the need to “shape a favorable and positive environment.” In detailing India’s constructive approach to maritime security, this chapter tackles such disparate themes as multilateral maritime engagement, strategic military assistance, local capacity building, technical cooperation and strategic communications. That many of these issues account for a large part of India’s current maritime security activity, is a standing testimony to the Indian navy’s effectiveness in its primary area of operations. Ensuring Secure Seas is also a more crisply articulated publication. The authors benefit from not having to explain rudimentary concepts as its predecessor document. Instead of repeating the Indian Navy’s strategy for peacetime as explained the previous version, the IMSS replaces the relevant section with three concise chapters – one each for deterrence, coastal security and the regional strategic environment. Alongside articulating India’s peacetime maritime objective, these chapters also establish common ground between the operational priorities of the navy and the strategic proclivities of the policy establishment – particularly the defense bureaucracy. Whilst proclaiming the Indian navy to be the principal ‘security provider’ in the IOR, the IMSS also lists measures taken to achieve that storied status. This includes balancing prevailing threats, meeting risks and rising challenges through continuous monitoring, and a containment strategy for non-traditional challenges. In laying out India’s maritime imperatives in the wider Indian Ocean Region, the authors advocate a regulation of maritime conditions in a manner that doesn’t allow for a proliferation of risks, even if individual challenges aren’t always addressed comprehensively. As expected, the most comprehensive chapter is on coastal and offshore security. Since the 26/11 attacks in Mumbai there have been a slew of measures taken by the Navy to augment coastal security measures. This includes a plan for greater maritime domain awareness through static and dynamic surveillance, and the setting up of position reporting systems, vessel management schemes and port management systems. The Navy has also been pursuing an “information networking and management project,” which involves greater coastal community participation. The section covers the individual projects undertaken in some depth, providing a detailed picture of what has been achieved, and those objectives that still remain unaccomplished. The clearest enunciation of the way ahead, however, comes in the last section on “maritime force and capability development.” From conceptual capability-building to human resource development and force-structure planning to power-projection asset creation – the document explores myriad measures to improve the Navy’s strategic potential. The authors delve into issues of human resource development, indigenization, modularity and standardization. In articulating India’s maritime infrastructural needs, however, the conceptual gaze remains firmly fixed on the navy’s operational imperatives. While the document recognizes the needs of the civilian maritime sector – better port capacity, maritime industrial infrastructure and the needs of sustainable development – the emphasis remains squarely on realizing the naval operations dividend. Despite its many attributes, however, the IMSS-2015 falls short of being the visionary document that it was widely expected to be. In a world of growing geopolitical entanglements, the Indian Navy requires a forward-leaning strategic blueprint for enhanced maritime reach and deployment in the Asian littorals. Despite seeming to strike the right notes, the new publication sticks rigidly to its operational comfort zone in the Indian Ocean. While it does attempt to expand the Indian Navy’s primary and secondary zones of operations, the change is cosmetic and conveys the impression of a force growing in capability and aspiration, but one acutely conscious of the material limits of its power. Consequently, the document does not adequately account for the new and emerging framework of the “Indo-Pacific,” mentioning the term only once in the foreword, and that too as an expression of growing global interest in the region. Likewise, China’s growing presence in the Indian Ocean Region isn’t covered in any objective detail. In recent days, there have been instances of PLAN submarine deployments in the IOR, even as Chinese anti-piracy patrols have, with the addition of sophisticated warships and amphibious platforms, acquired a strategic character. The document does not dwell on the possibility that China may be close to developing a littoral framework of operations in the Indian Ocean and might be familiarizing itself with the operational environment in the region. It is hard, therefore, to escape the feeling that while the Indian Navy is preparing for a period of “fragile peace,” marked by growing irregular threats, the world might be moving towards an era of strategic mistrust and geopolitical instability. Even as the narrative attempts to realistically capture future challenges, the security establishment’s inherent conservatism in espousing maritime activism in the wider-Asian littorals is all too evident. The authors stick to a well-tested format, avoiding a discussion of areas that might be deemed controversial. Their portrayal of India’s growing maritime diplomacy as a transformational attribute and a viable counter to aggressive posturing by hostile powers doesn’t come off as entirely convincing. Notwithstanding the Navy’s utility as a diplomatic tool and an international relations enabler, employing sea-power solely for foreign relations enhancement in the distant littorals does seem to be an under-utilization of its strategic potential. While port visits, staff talks, personnel exchanges, and passage exercises are all very useful things to do, these are not a substitute for high-spectrum strategic engagement. In that respect, the document shies away from pushing the boundaries of strategic imagination. To be fair to the authors, they do try and calibrate the maritime posture within the parameters laid down, without straying too much from the traditional line. Their inability, however, to portray greater strategic ambition for the Navy renders this document an exercise in smart profile-building, rather than one of purposeful image-projection. 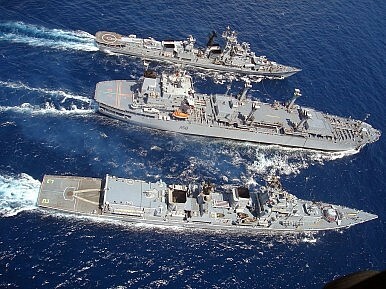 India's International Fleet Review highlighted the growing importance of naval power to India's geopolitical vision. Cyclone Idai and India’s Role as a New Security ProviderWith Over 50 Navies Participating, India Concludes 2016 International Fleet ReviewMalabar 2015: Strategic Power Play in the Indian OceanIndia Unveils New Coastal Surveillance Radar NetworkWhat Did India’s Foreign Secretary Achieve on His Trip to Russia?